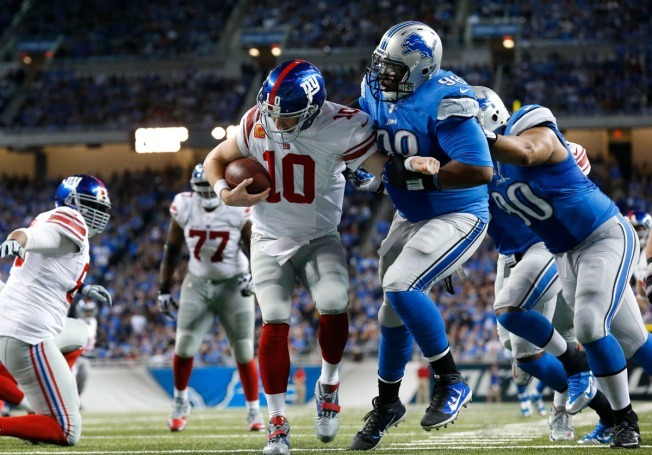 Detroit Lions defensive tackle Nick Fairley (98) sacks Giants quarterback Eli Manning (10) in the end zone for a safety during the third quarter Sunday. Fairley was a monster in college, and then was paired with Ndamukong Suh by the Detroit Lions to create the best defensive tackle duo in football. In 2014, the duo was derailed when Fairley was injured in the Lions' eighth game and missed the remainder of the regular season before returning for the Lions' Wild Card playoff loss to the Dallas Cowboys. Now, the Cowboys could be looking for his services as the free agent tackle will hit the market along with his teammate Suh. It is believed Suh, who could also be a Cowboys target (a higher-profile, more expensive one), will most likely return to Detroit, but can the Lions afford to keep his running mate, as well? Fairley was stout in both 2012 and 2013 — finishing with around 30 tackles and six sacks in each season — while helping lead one of the league's best defenses. He'd instantly step in and be a force for the Cowboys, who need a force or two up front to pair with guys like Tyrone Crawford and Jeremy Mincey.